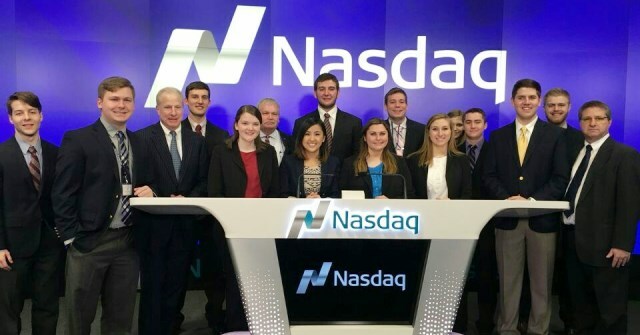 Last week, 14 Westminster students in the Blue Blazers Investment Committee (BBIC) visited New York City to learn about the world of Wall Street firsthand, making this the 8th time the group has traveled to the Big Apple. Highlights of the trip included visiting the New York Stock Exchange, JP Morgan Asset Management, Bloomberg Business News, Wells Fargo Securities, GAMCO/Cabelli Funds, the Museum of American Finance (an affiliate of the Smithsonian Institution), and attending the opening bell ceremony at NASDAQ OMX. “This trip was a great experience because we all got to learn about value traps, practice networking skills, and ask questions of those more knowledgeable than us,” says Amelia Ayers ’16. The group also attended an alumni reception at the famous New York Athletic Club. The trip is planned and coordinated by Brock Ayers, ’82, BBIC founder and mentor to the group, and the group’s advisor, Dr. Edward Mirielli, Chair of the Computer Science Department, with the assistance of Wells Fargo Advisors. Ayers is a Financial Advisor and First Vice-President-Investments at Wells Fargo Advisors and is a member of the Westminster College Board of Trustees. Sophomore—Percy Vanacht from Chesterfield, MO. Established in 1996, the BBIC is a selective, student maintained investment committee that encourages intellectual growth and educates undergraduates on the use of investment vehicles in capital markets. To learn more about the group you can click here.